If you've heard of the Winning Poker Network's The Beast promotion but don't really know how it works, then we have the answers to your questions! In 2013, the management of the Winning Poker Network had a bright idea: "Let's scrap the Bad Beat Jackpot tables that we have, and convert that fee into a rake race to reward our high-volume players." It was then that The Beast was born! Running week after week, the money paid out via The Beast has truly reached massive proportions. 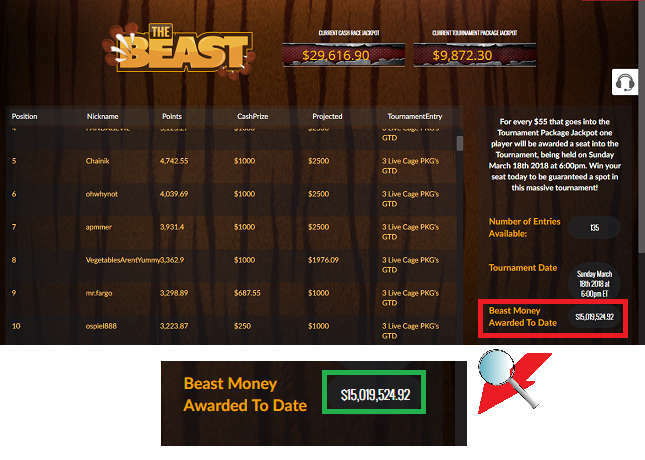 In March 2018, The Beast surpassed the $15,000,000 mark in total prizes awarded, easily enough to make it the largest rake race ever held online! How Does The Beast Work? The Beast is a progressive points race, although the points are closely correlated to rake paid, so we like to refer to it as a progressive rake race. A player has to earn "Beast Points" in order to move up the leader board. To reap the rewards of The Beast, all a player has to do is participate in any of the real money cash games (except for heads-up games) offered at any of the WPN brands, such as Americas Cardroom, Black Chip Poker, Ya Poker, and True Poker. The Beast is funded through a portion of the normal ring game rake taken from each pot, so you aren't paying extra to participate. Every cash game counts, apart from HU tables, so you don't have to waste time trying to find a qualifying table. For every $0.06 in rake, $0.02 is diverted to The Beast with a maximum of $0.04 Beast rake in two-player hands, $0.08 in hands with three players dealt in, and $0.24 if there are four or more individuals who received cards. For each $0.02 so contributed, you'll get 1 Beast Point. How Are the Payout Values Determined? The total Beast funds are divided up into a cash race jackpot and a tournament package jackpot. For every $55 in the tourney jackpot, a satellite tournament ticket will be awarded. This is typically an online feeder MTT that distributes packages to prestigious events, like the Live Cage and the World Series of Poker. For every $10,334 in the cash race jackpot, one payment is allocated for Level 1, two for Level 2, five for Level 3, and twenty for level 4. After deducting these prizes from $10,334, there's $2,584 left over, which goes toward funding The Beast pot for the following week. Any money remaining after splitting up the pool into $10,334 increments is distributed to the top finishers in Levels 2, 3, and 4. How Are The Beast Prizes Awarded? Every weekly The Beast period runs from Saturday 00:00 ET to Friday 23:59 ET. It's the points accumulated during this timeframe that count toward the leader board. All winners will receive cash prizes by the end of the following Monday. Tournament entries are for the second Sunday following the end of each The Beast competition. Players are automatically registered for the relevant event. Because the prizes are calculated and distributed from two distinct pools (cash race and tournament package), it's possible to qualify for one type of reward but not the other. The highest finishers every week, however, receive both cash and MTT tickets. How Many People Win Each Week? The number of people paid every week varies based on the total cash game rake paid into The Beast during that week. This sum has been known to sometimes surpass $100,000, and with 28 people paid for each $10,334 contained in the pot, this leads to at least 250 individuals scoring cold, hard cash during these weeks. Typically, more players receive satty MTT entries than monetary awards, so it's not uncommon to see more than 300 people paid in total. During the week, it's easy to see where you stand in The Beast. Simply log into the poker software at your WPN site of choice. Then click on “Leaderboard” for The Beast in the top-right corner of the lobby. Your web browser will open with The Beast standings displayed. You'll be able to see your current position and the prize(s) you stand to win. Bear in mind that the Beast prize pool is constantly growing while you and your competitors are playing, so the final results may be different from what you see. Ready to Earn Goodies From The Beast? If you're eager to claim your share of rewards from The Beast but you don't yet have an account at the Winning Poker Network, then now's a fine time to sign up. Our preferred WPN skin is Americas Cardroom because it's the flagship site and has a few perks that its partner sites lack. Upon making your first deposit, you'll get a 100% up to $1,000 bonus that clears at 20% rakeback. Furthermore, you'll be granted a free $50 credit to your real money balance. Read our review of Americas Cardroom to learn all about this premium poker operator. Step 3: You'll need to choose whether you want a 27% rakeback account or a VIP Elite Benefits account. Rakeback is best for low-volume players while Elite Benefits caters to those willing to put in consistent play at meaningful stakes month after month. If you have your heart set on scooping up a lot of free cash from The Beast, then Elite Benefits is probably the right choice for you. However, we recognize that people who play infrequently or who must take periodic breaks may be better served by rakeback even while still preserving their ability to claim a Beast prize or two during those weeks that they're able to focus on the tables. You can check out our Elite Benefits vs. 27% Rakeback comparison article for further insight into which program would be best for you. Step 4: Click the button below corresponding to either Elite Benefits or rakeback depending on your preferences. Step 5: Download,install and open the poker client. Step 6: Create an account and log in / username. When doing so, use the bonus code corresponding to the type of account you wish to enjoy! 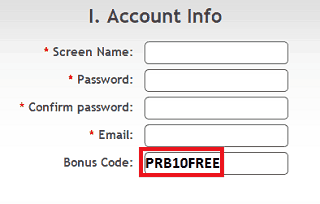 Type in the bonus code PRB10FREE for Elite Benefits and a $10 no deposit bonus or PROFRB27 for rakeback. Read more about the $10 free bankroll offer, especially the important terms and conditions that apply to it, in our page devoted to ProfRB exclusive deals. Step 7: Create your tablename (this is displayed on the tables). Step 8: Skype or Email your login name and registered email address to Professional Rakeback for new account VIP confirmation. Step 9: We recommend that you pre-verify your account by contacting live chat as doing so will insure that when it comes time to withdraw your winnings, there will be no delays. Verification may also result in higher deposit limits.